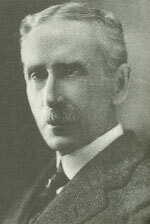 Prolific Presbyterian clergyman Charles William Gordon wrote more than twenty popular novels under the pseudonym Ralph Connor, becoming the country's bestselling indigenous author prior to World War One, commencing with Black Rock: A Tale of the Selkirks, in 1898. His fiction, much of which was inspired by his missionary work in Banff and Canmore from 1890 to 1893, was written to raise money for missions. From 1894 until his death in 1937, he lived in Winnipeg. Much of his moralizing fiction was set in the frontier of Alberta, but some stories spread slightly westward, including The Doctor of Crow's Nest Pass (London: Hodder and Stoughton, 1906). The Doctor of Crow's Nest Pass (London: Hodder and Stoughton, 1906).